Usually classified by contemporary authors such as Rivers as a Hybrid Perpetual, it is a parent of the very distinctive race of Hybrid Perpetual roses bred by Vibert. In 1888 William Paul classified ‘Géant des Batailles’ in a sub-group of Rosa indica which resemble ‘Gloire de Rosamane’, a Bourbon rose, and it is usually today classified as such. In 1903 Paul classified it as a Hybrid Perpetual. ‘Géant des Batailles’ has very large, double crimson flowers, shaded purple, expanded, on a shrub of vigorous growth, and was regarded by Rivers as the most bright and brilliant of all roses, and at the same time the most hardy and free-growing of all. [Paul (1848, 1863, 1888, 1903), Henry Curtis p. 7 vol.1/1850, Amat]. Introduced by Nérard of Lyons in 1845. 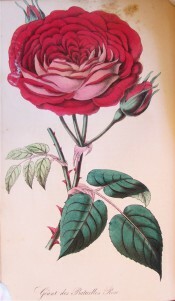 A very popular rose in its time, Thomas Rivers reported selling 8,000 in 1849 alone. [Rivers (1854, 1857, 1863)]. It was figured in the Floricultural Cabinet. [FC p.73/1850]. According to The Gardeners’ Chronicle ‘the first and the last rose of the season to bloom’. [Gard. Chron. 1846]. Louis van Houtte included ‘Géant des Batailles’ in an Énumération des plus belles variétiés et….des autres!, all Hybrid Perpetuals, in the Flore des Serres. [FS. pgs. 91-102 vol.15/1864]. Listed in the 1850 and 1857 catalogues [T.891/1850]. Obtained from Veitch’s Nursery in the same importation as ‘Narcisse’. Believed to be new to the colony. [ML A1980-3].